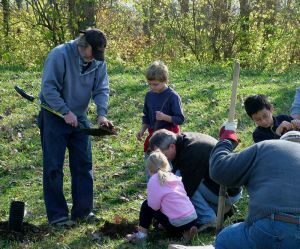 Is Spring or Fall the Best Time to Plant a Tree? The spring season is synonymous with all things green, and that includes planting trees. But spring isn’t the only time of the year when you can plant trees – fall is a great time, too. Many people overlook planting trees in the fall because they are prepping their yards for the winter. Yet planting a tree during the fall season has many benefits because of the cooler temps that are gentler on developing roots. Still, there are things to be concerned with since fall quickly turns into winter. Let’s take a look at the advantages to sprucing up your yard with new trees in both the spring and fall months. If you have considered planting trees, ask yourself why. Are you looking for more shade during the summer months? Do you want to add more color and character to your outdoor space? Are you interested in creating more privacy and a noise barrier from your neighbors? If so, planting in the spring will help you meet your goals sooner. Waiting until fall means that you’ll be enduring another summer without trees in your yard. The spring months have their advantages for new trees because of the consistently warm temperatures that allow trees to grow their roots and become established, something that can become difficult when the winter weather sets in. With warmer temperatures, the soil also remains warm. This warm soil is what trees need to experience healthy root growth, as once the soil gets cold, root growth basically stops. The summer rains will also contribute to warm, wet soil that will keep the tree’s roots strong. Surely, there are some considerations to think about, especially if you live in a climate with hot, humid summers that can take its toll on the roots. Tree nurseries are stocked on trees, shrubs and plants, so it’s easy to have first pick at what you want. There is another side to the story of course, as some people believe that planting trees in the fall is actually best. While some argue that this is just a ploy to help tree nurseries and landscapers pick up slow sales, there are some real benefits to planting trees in the fall. First, the temperatures grow cooler, so you don’t have to be concerned with too-high temperatures that place stress on the roots. Also, fall is a time where many areas get a lot of rain, and these warm, wet soil conditions are optimal for root growth. Furthermore, because the shrubs and perennials fall dormant in the fall and winter, they don’t require their energy to make new leaves, so they instead expend this energy into the ground, contributing to a strong root system. When you choose to plant trees in the fall, you can also expect strong trees by next spring so that you’re ready to kick off the summer with a lively yard. the tree more able to withstand droughts better. Is One Season Better than the Other? The answer to this question largely depends on the type of tree you’re planting and the climate that you live in, but in the majority of cases, early fall is really the best time to plant a tree. The good news is that once a tree is established, it can safely endure winter without being vulnerable to winter injury or winter dying.